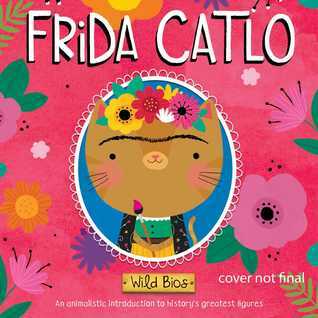 This adorable board book tells the story of Frida Kahlo, a famous Mexican artist reimagined as a cat with nine lives. The simple story-telling is perfect for young little readers, and a wonderful way to introduce them to this well-known artist. The book includes Diego Rivera as a dog, making him “Doggo” Rivera, and animalistic versions of some of Frida’s most famous paintings. The cartoon illustrations are full of vibrant colors and cute animals. The writing hilariously uses animal made-up words, like “purr-fect”, “furgotten”,”Meowxico”,”mewseum”, and “paw-traits” instead of portraits. The whole book is bright and funny! It talks about Frida’s early interest in photography, her love for birds and pets, how she began painting portraits of her sisters and friends at a young age, and how she met Doggo Rivera, and traveled to France as the first Mexican artist to be included in the Louvre. I think that young children would be inspired to find out more about Frida and develop an interest in art and new cultures. As soon as I read it, I sat down to Google more about Frida and her colorful artwork. I was also interested to see the rich Mexican culture beautifully represented in this book. I grew up in Mexico as a child, and it was like a breath from home to see the plants, buildings, clothing, and wildlife of my own country in the background of the sweet illustrations.